The island of Kythnos - Κύθνος lies south-east of Kea and is a rocky and barren island of karstic limestone, that is usually covered in an abundance of colourful flowers in the early months of the sailing season. The coast is much indented - with many beautiful anchorages and ports - and for the most part falls steeply down to the sea. The inhabitants live by farming and fishing. In antiquity iron was mined on the island. The two main ports are Mericha and Loutra. Mericha - only minutes sailing away from the oddly shaped Sandbar Bay - is the smaller of the two. Loutra on the north-east nowadays even has a new harbour with new moles providing the best protection from the Meltemi on the island. The mineral baths after which the port took its name, are unfortunately no longer in use. The mineral springs were already frequented in Roman times and can still be seen as (covered) streams that flow towards the port. 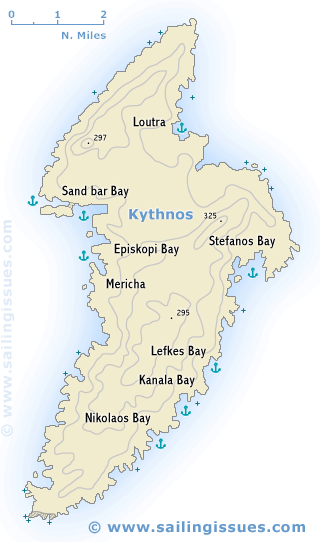 The anchorages in Stefanos Bay are also worth visiting. The two charming inland villages, Chora (Kythnos town) and the lively little Dryopis, can best be visited by scooter or bike. The first settlers were Dryopes from Evvia, who were later driven out by Ionians. Kythnos never played any important part in history. To the north of Mericha, on a high crag above the bays of Apokrousis and Episkopi, are the ruins of the Kythnos' former capital, Vryokastro (Evraiokastro). On the rocky offshore island in Sandbar Bay, originally connected properly with the mainland, traces of the agora and of a number of tombs in the surrounding area can still be identified.